Who is running Vicki’s social media pages? Even if Vicki is running her on accounts, does she not have any true friends who would tell her it’s not the best look to post a collage of hospital photos? Joining Vicki in the photos is her possible future fiance man Steve Lodge. Vicki told her followers, “Had another ‘non elective’ procedure yesterday and feeling much better today. Thank you to all that reached out. #itsalwayssomething#cantkeepmedownlong #filmingtoday#lifeofvicki #puffybedwarmer #notababy .” So many hashtags. Another wrote, “Stop doing this to yourself. You will be sorry when you say this is my last and you won’t look at all like Vicki. You are much smarter than this!” Debatable. Is it possible that so many people just didn’t read the caption? Or did she change it after the fact to add the words “non-elective surgery”? 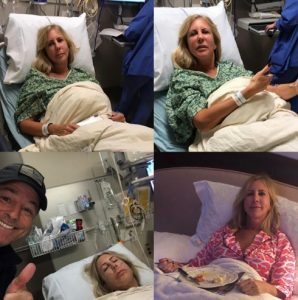 TELL US- WHAT DO YOU THINK ABOUT VICKI GUNVALSON POSTING PHOTOS FROM THE HOSPITAL ON INSTAGRAM? DO PEOPLE CARE TO SEE THOSE? SHOULD SHE JUST FOCUS ON HER RECOVERY?